The Teacher Capacity Building Programmes for developing teaching skills and techniques focused on enhancing skills and knowledge of teachers on using ICT as a tool and CAI (Computer Assisted Instruction) for improving teaching and learning strategies. The SEAMEO Secretariat in collaboration with SEAMEO RECSAM sponsored four teachers of Chonkanyanukoon School to attend the in-country training for teaching Science and Math on 26-30 November 2007. In collaboration with Princess Sirindhorn's Information Technology Project, five teachers of Ban Subsanoon School participated in a workshop on Sharing Experience: ICT Pedagogy Integration on 2-5 May 2008. The SEAMEO Secretariat in collaboration with Pintar Learning SDN BHD, Malaysia organized a seminar on Transforming Teaching and Learning with Innovative Technology on 29 May 2008. Teachers from three schools were invited to participate in a seminar. The SEAMEO Secretariat coordinated with the Princess Sirindhorn's Information Technology Project in the conduct of the training workshop on "Using CAI to Improve Teaching and Learning Strategies" for all teachers of(2) 20-Nov-08 Ban Pruewai and Ban Subsanoon School on 3-4 October 2008 and 10-11 October 2008, respectively. SEAMEO Secretariat in association with Pintar Learning, conducted a handson training on Integrating Pintar Learning System with Lesson Plans to teachers (primary and secondary) of Ban Subsanoon School on 18-19 September 2008 and 23 -24 October 2008. 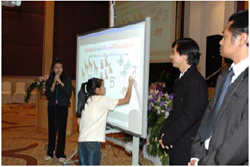 Three teachers of Ban Subsanoon School were selected to demonstrate and present the lesson plans by applying the Pintar Learning Programme for teaching Science and Mathematics for kindergarten, primary and secondary education at the presentation session on A New Dimension of Teaching and Learning Science and Mathematics at the ICT Conference of Her Royal Highness Princess Maha Chakri Sirindhorn on 22 November 2008.